A Powerful 7.3 Magnitude Earthquake Struck Near the South Sandwich Islands. | Chaos Sweeps Away the World We Know! The Disaster, current events & Catastrophe Blog. Forecasts for 2014 to 2022. Read tomorrows news today! Plus current economic, commodities, stock indices and financial news. ← United States Volcanic Eruptions, Over the last 6,372 Years. A Powerful 7.3 Magnitude Earthquake Struck Near the South Sandwich Islands. July 15, 2013 – A Very Powerful 7.3 Magnitude Earthquake Struck Near the South Sandwich Islands (see map): A 7.3 magnitude earthquake hit south of Bristol Island in the South Sandwich Islands. No tsunami alert exists. The considerable 7.3 magnitude temblor hit at 2:03PM (GMT) July 15, 2013. It was 12:03PM local time. It was initially reported as a 6.8 magnitude quake before being upgraded, by the USGS, to 7.3. It occurred at a depth of 31 kilometers (19 miles). If this quake had occurred near a large city, it would have been catastrophic. However, since it occurred far out at sea; no damage was done and no tsunami alert was issued. The quake was 1,600 miles west of Ushuaia and Rio Gallegos, Argentina; 1,600 miles west of Punta Arenas, Chile and 1,300 miles south of Port Stanley in the Falkland Islands. 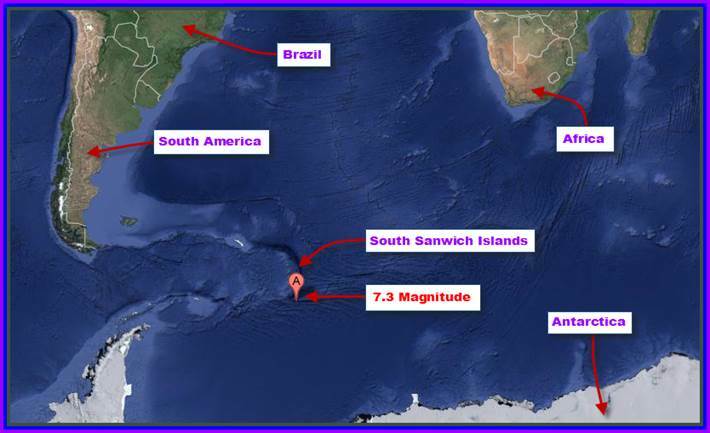 This entry was posted in Africa, Argentina, Atlantic Ocean, Brazil, Chile, Earthquake, Edgar Cayce, Madagascar, Papua New Guinea, Peru, South Africa, The Sandwich Islands, United Kingdom and tagged argentina, Bristol Island, Falkland Islands, Punta Arenas, South Georgia and the South Sandwich Islands, United States Geological Survey, Ushuaia. Bookmark the permalink. 1 Response to A Powerful 7.3 Magnitude Earthquake Struck Near the South Sandwich Islands. Reblogged this on at wits' end.